Are you looking for a romantic getaway with your special someone in South East Asia? Perhaps you’re celebrating an anniversary or just want to escape from the stresses of life back at home. If this sounds like you, your dream destination is Thailand. You can book a beautiful rental in thailand near the beach or a luxurious hotel in Bangkok to unwind for a week or two. So, before you pack your bags and jump on the plane, check out the following romantic experiences to make your trip even more special. What can be more romantic than walking along the soft sandy beach with the warm waters gently lapping on the shoe? You’re hand in hand with palm trees to one side and the darkening blue water of the sea to the other. The scenery is incredible, and you’re walking in the very definition of a tropical paradise. Watching the sunset is a romantic experience anywhere in the world. But, that feeling is magnified in Thailand. If you’re staying at a beachside resort or vacation rental, sit on your balcony and enjoy the magical experience with a glass of wine. Watching the sunrise is equally as romantic as the sunset, but few people make it out of bed. The sun often rises before 6:00 am when most are still fast asleep. If you can get up, watching the sun light up Thailand’s natural beauty as the day breaks is unforgettable. Sometimes you may be able to see both the sunrise and sunset on the same beach depending on where you are. Other times you may need to travel to find the perfect spot. River cruises are a favourite pastime in Bangkok for tourists. Some take you on a sightseeing tour of the city whereas others have a romantic dinner. If you know the right places and aren’t on a budget, you might be able to get yourself a private boat. Picture sitting on comfortable leather seats being whisked around Bangkok’s network of canals and rivers while enjoying time with your partner. Boat rides are nice, but nothing can quite beat the feeling of exclusivity on a private one. Another romantic experience in Bangkok is to head to the Central District and go to The Moon Bar. This is an exceptional spot for a drink. The outdoor bar has 360-degree views from the 61st floor and claims to be one of the world’s highest outdoor bars. Drinks are, as expected, expensive but the price is worth it. You can sit on one of the cushioned sofas with a drink or have a candlelit table with incredible views. If you’re planning to spend any time in Bangkok, checking out The Moon Bar is a must. Chiang Mai makes a great spot for couples with beautiful mountainous landscapes, a historical centre and a laid-back city a million miles away from Bangkok’s noise and pollution. Apart from enjoying the temples, hiking trails and renting a motorbike to explore the province, you can go on a hot air balloon tour. 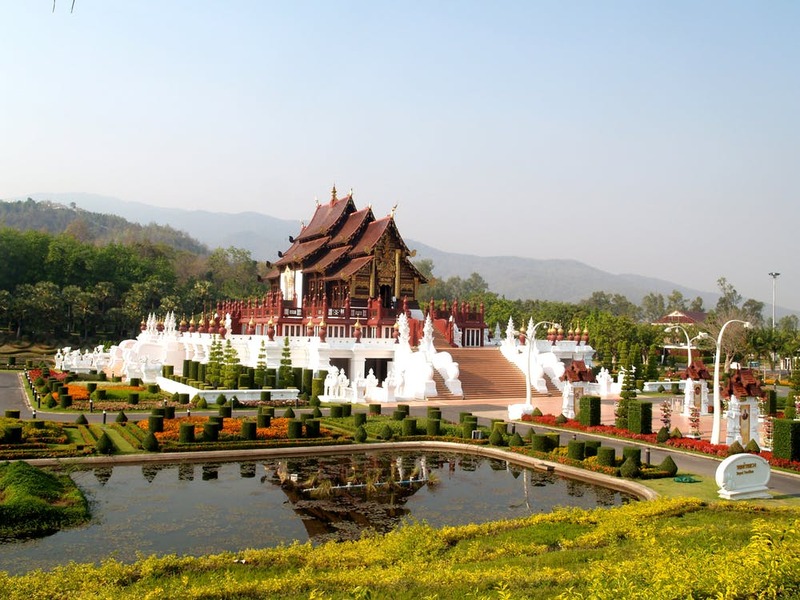 Tour packages include a short flight taking you high over the mountains and hills of Chiang Mai to give a bird’s eye view of the incredible landscapes below. Some packages offer private tours and have an after-flight meal. If you have never taken a hot air balloon ride before, now’s your chance to tick it off the bucket list in style. Thai massages are available on almost every street around the country. Locals will give you a massage on the beach or in their own shop. But, Thailand is also famous for having world-class spas and wellness centres that are some of the best in South East Asia. You can have a massage and the full treatment with various types of therapies and relaxation techniques. If you and your partner are looking for a few days of recuperation, book yourselves into one of Thailand’s spas for some pampering. Most of the luxurious hotels have an onsite spa, which you should take advantage of at least once during your trip. And when you’re both super refreshed and relaxed, what can be better than a candlelit dinner or rooftop cocktails? There are thousands of islands in Thailand catering for different tourist interests. Some host the Full Moon Party attracting backpackers and younger travellers for a night of fun. Others are much quieter and have a very high level of luxury. It’s safe to say that you’ll find what you’re looking for on one of Thailand’s islands. But, if you want romance and privacy, check out some of the less visited spots. There are hundreds of places around Thailand’s archipelagos where very few tourists visit including Koh Samet, the Koh Yao Islands and Koh Similan. It’s also possible to find a beachfront rental or resort with a private beach on the more famous islands like Phuket and Koh Samui. If you’re looking for romance, Thailand has it. From the secluded spots on tropical islands to Bangkok’s rooftop bars and Chiang Mai’s hot air balloon tours, you’ll find something to have a memorable trip. Be sure to see the sunrise and sunset at least once and have a day or two at the spa. Follow these suggestions, and you’re sure to have the most romantic time of your lives.